Lyndsay De Luca has a secret not even her family knows. In one month her first novel, A Cowboy in Montana, will be on released. For Lyndsay, the publication of her book is a dream come true. Even the timing is perfect since her novel’s release comes just after the school year ends so any reactions from the parents of her students to a romance writing middle-school math teacher will be muted. But what should be an exciting time in Lyndsay’s life is marred by her realization that she modeled the hero of her book on Will Sweet, a member of one of Valentine Valley’s leading families and a close friend of Lyndsay’s brother, Tony. It’s true that Lyndsay had a crush on Will when they were in high school, but that was long ago. She can only hope that no one else in Valentine Valley will see any connection between the sandy-haired, hazel-eyed cowboy capable of grand romantic gestures in her book and Will. Will Sweet is deeply committed to his life on Sweetheart Ranch. He loves the family ranch, and his role as a helicopter pilot cowboy satisfies his daredevil nature that also glories in snowboarding and mountain biking. But his commitments begin and end with those he has made to his family and the ranch. Women like Will, and he likes them right back so long as the relationships stay casual with no expectations about tomorrow and definitely no promises about forever. Sixteen years ago Will’s high school girlfriend was killed in an automobile accident, and Will has not allowed himself more than light-hearted, short-term relationships since Brittany’s death. His avoidance of serious relationships doesn’t mean that he doesn’t have an eye for a beautiful woman. Only Tony De Luca’s long ago warning to stay away from his sister has kept Will from asking Lyndsay out, and when Lyndsay asks him, he is ready to add a little spice to their solid friendship. Will’s feelings for Lyndsay quickly develop into something stronger than he ever imagined they could be, but he cannot embrace the future that this relationship offers until he can let go of his ties to the past. Ever After at Sweetheart Ranch is the sixth novel in Emma Cane’s Valentine Valley series. Readers who enjoy friends-to-lovers stories will enjoy this tender romance with likeable characters and sufficient complications to keep things interesting. Both Lyndsay and Will appear in earlier Valentine Valley novels with significant secondary roles in Sleigh Bells in Valentine Valley, the reunion story of Lyndsay’s brother Tony De Luca and her former best friend and sister-in-law, Kate Fenelli. Lyndsay as heroine is a pleasing and logical extension of the character that fans of the series will remember. Will, who appeared to be an amusing, light-hearted flirt as a secondary character, retains his charm but also proves to have considerable depth. I found Lyndsay’s use of Will as inspiration for her hero fascinating, particularly since it was done unconsciously. I also admired Lyndsay’s willingness to take the initiative with Will. The progression of their relationship is credible, and readers will have no difficulty believing in a happily-ever-after for these two who share history, interests, values, and a community as well as chemistry. This new novel is a welcome addition to a solid series that has the appeal of small-town romance plus a sigh-worthy collection of cowboy heroes. Lyndsay and Will’s story can be read as a standalone, but it will be a richer, more nuanced read for those who have read the other Valentine Valley books, especially Sleigh Bells in Valentine Valley. Cane has announced a new series, Fairfield Orchard, set in the Blue Ridge Mountains of Virginia. 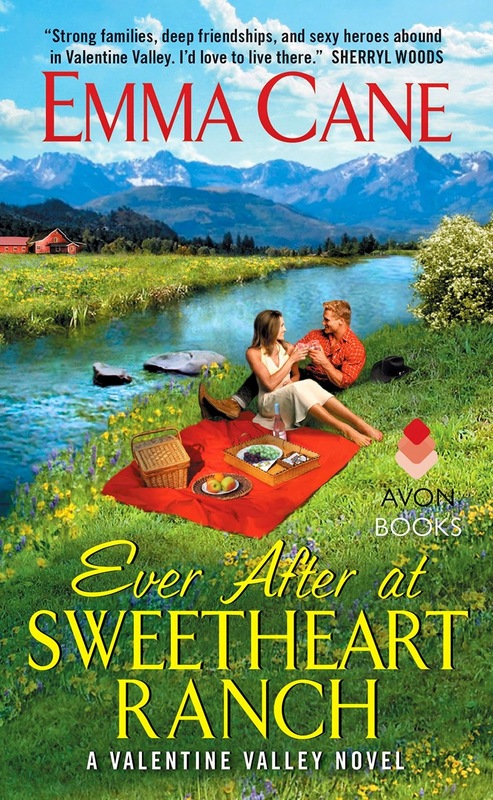 I feared that meant Ever After at Sweetheart Ranch was the final Valentine Valley series, but the author has reassured her fans that she is not leaving Valentine Valley yet. I’m delighted with the promise of more visits to this Colorado town. Would love to read this, I have read a few books in this series and their awesome. I've only recently discovered her books. I will look for her Valentine Vally series.